Elegant in Silver Ice Metallic, our top-of-the-line 2016 Chevrolet Malibu Limited LTZ Sedan stands out from the crowd with exceptional performance and a wealth of amenities. Powered by a 2.5 Liter 4 Cylinder that generates 197hp while perfectly paired with a 6 Speed Automatic transmission for natural passing authority. This Front Wheel Drive luxury sedan offers near 34mpg on the highway and a composed ride with excellent handling. Take a moment to admire the contours of our Malibu Limited LTZ that exude a premium look and feel with chrome accents, LED tail lamps, and unique wheels. Open the door to our LTZ to find an impeccably built interior that has been created with your needs in mind featuring steering wheel mounted controls, a driver information center, and heated leather front seating. Stay seamlessly connected thanks to Bluetooth, available OnStar with Directions and Connections, Chevrolet MyLink with a touchscreen, and WiFi capability. Drive confidently in our Chevrolet knowing this reliable, and well-built machine boasts ten airbags, StabiliTrak Electronic Stability Control, and other advanced safety systems. 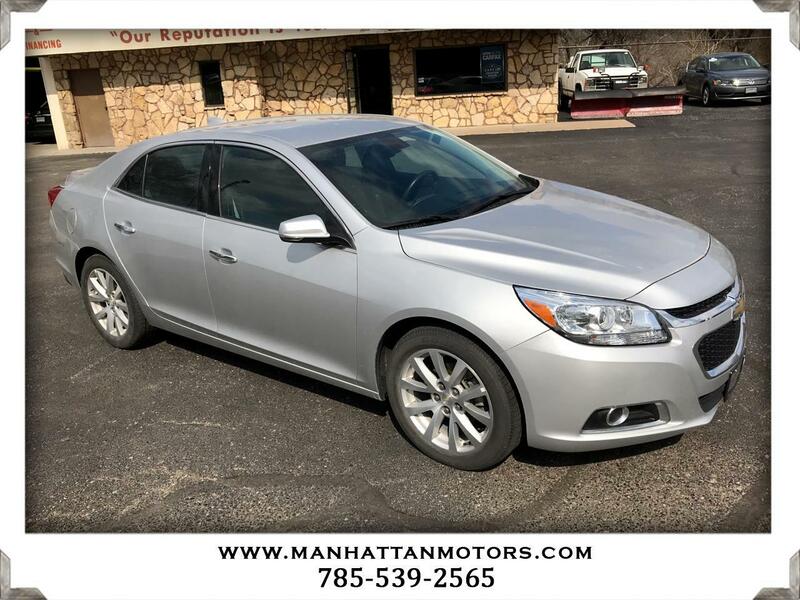 You're going to love your Chevrolet Malibu Limited! Print this page and call us Now... We Know You Will Enjoy Your Test Drive Towards Ownership! Thanks for choosing Manhattan Motors. We recently won The Manhattan Mercury Readers' Choice Award for being the #1 Used Car Dealer. Buyers enjoy our "laid back" approach. No test drive routes or high-pressure salesmen. Our focus is to offer all of the information you need to help make the best decision for your family or business. Each one of our vehicles undergoes a 30-point vehicle inspection by Burnett Automotive, Manhattan's #1 Auto Service Facility. We are also the area's only Independent USAA Certified Dealer, offering discounts on purchases and interest rates.